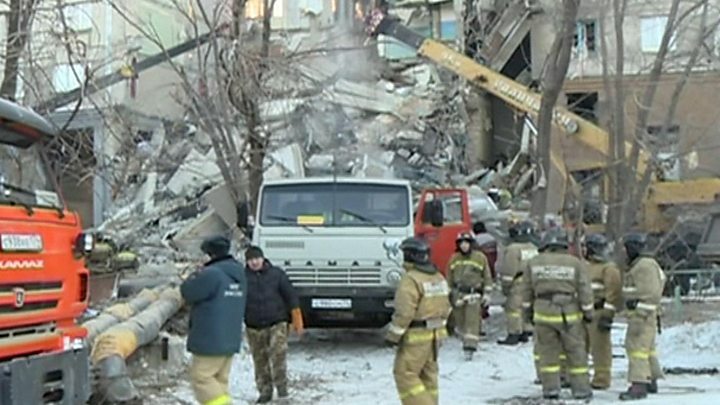 An 11-month-old boy rescued from the ruins of a collapsed apartment block in the Russian city of Magnitogorsk is said to be conscious but in an "extremely serious" condition. The country's health ministry says he has severe frostbite to his limbs, a head injury and multiple leg fractures. The boy, named Ivan, has been evacuated to Moscow for treatment. His mother also survived the suspected gas explosion, which killed at least 14 people. Twenty-seven people remain unaccounted for. 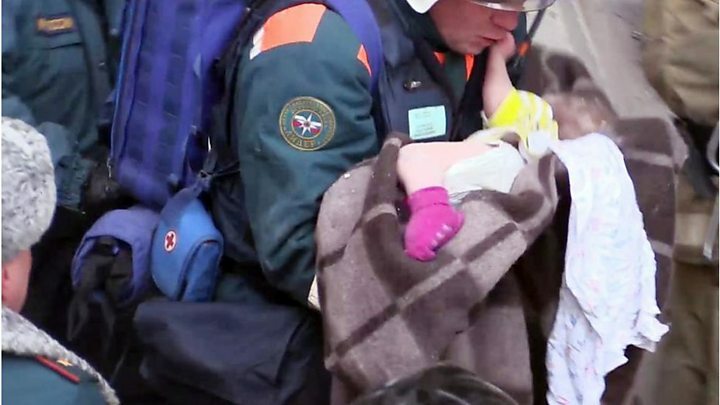 Ivan was found after spending more than 30 hours in sub-zero temperatures in the rubble of the apartment block. He was found wrapped in a blanket and in his cot in the Urals region city, about 1,695km (1,053 miles) east of Moscow, where the daytime temperature is about -17C. One rescuer, Pyotr Gritsenko has described how the infant, whom he initially thought to be a girl, was found. "[We made sure there was] silence so we could hear if sounds were coming or not," he told Russian state TV channel Rossia 24. How did the explosion occur? The blast, at 06:02 local time is thought to have ripped through the first floor, which houses some offices, and the seven storeys above then collapsed. The building was home to 120 people, and 48 flats collapsed in the blast. Nearby flats were also damaged. "I woke up and felt myself falling," one witness told Russian television, according to news agency AFP. "The walls were gone. My mother was screaming and my son had been buried." Another witness spoke of a "wave of fire" which followed the explosion. A criminal investigation has been opened into the disaster. Wednesday has been declared a day of mourning in Magnitogorsk.